Works with you to develop an affordable, custom health care plan for your senior or loved one. Compassion Home Care provides in-home, daily assistance for seniors, loved ones and the medically frail that enables them to stay in their home and maintain their independence and dignity. We treat every client as family and every service as a privilege. Contact Us Today. Let us schedule a free, no-obligation in home consultation to discuss home care options and develop a personalized plan that’s right for you. We love our Veterans! They served us proudly, and we are honored to serve them. Contact us about our discounted home care programs for Veterans. Serving Johns Creek, Alpharetta, Dunwoody, Duluth, Norcross, Lawrenceville, Suwanee and surrounding areas in North Fulton, DeKalb, Gwinnett and South Forsyth Counties. 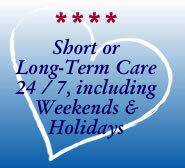 Thinking about home care for a senior or loved one? Customized Service. No two seniors are exactly alike, and each will require different types of assistance. A customized senior care plan will ensure you’re receiving and paying for the type of services you need. Free Advisement and Consultation. Will a key employee from the home care agency meet with you, at your home and on your schedule, to listen and guide you to the options that are best for you – even if those options don’t include home health care? Type of agency – franchise or independent? Independent home care agencies may offer more flexibility in payment terms, pricing, types of service and even locations served. A franchise may be restricted to a franchise agreement in all of these areas. Emotional and spiritual needs. Seniors often need much more than just physical care. They may need emotional and sometimes spiritual care as well. Your long term care agency should respect and support your loved one’s spiritual and religious values. Still have questions? Click on “12 Questions You Must Ask When Selecting a Home Care Agency” or call 404-432-5590 today. Copyright © 2009–2019 by Compassion Home Care, LLC. All rights reserved.